Wine flights start at $7, glasses start at $7, full bottles priced $17-$23. We have a variety of whites and reds available by the glass and bottle year-round, including our award-winning Rosato (gold at SF Chronicle competition) and Chardonnay (double gold and best in class at Humboldt County Fair). This is a free event for current wine club members. This is our quarterly wine club event. We are going to be tasting a flight of our wines. Wine Club members should try to attend this event and pick up their wine. Our pizza oven is open all day Saturday at noon. You can order at the rear winery and get it delivered to your table. Plain pepperoni or cheese pizzas are $10 each. Not a member? Flight tasting is $20/person. Hello! Looking for a fun way to spend Mother's day? We will have live Celtic music on our stage in the middle of the afternoon with Fiddler Blake Ritter and cellist Summer McCall. We'll be open for tasting at noon. Also, for the kiddos, we are having gnome hunting and special Easter treats, for winners of our contest, who are the finders of 25 or more gnomes. Lastly, for you Fieldbrookers, if you walk or bike you get $1 off each pizza, glass of wine, bottle of wine, etc. Parking on the street doesn't count … we are incentivizing you to leave your cars at home and save our lawns. Just tell us when you're ordering. Voted Best Festival in Humboldt County (again) by North Coast Journal. This event features many, many talented arts and crafts vendors, curated to include the best artisans and artists in the region. Ask your friends - this is the best art festival around. Admission is free. Oysters, smoked and grilled albacore and chicken, live music, fresh delectable desserts. And of course local award-winning Fieldbrook Winery wine by the glass and bottle. See our new wood-fired pizza oven at the winery! This event is a benefit for the Fieldbrook Educational Foundation, a nonprofit that supports the local elementary school. Please carpool or bike if you can, or park at the elementary school for overflow. If you are a vendor and hoping to apply, please message the Fieldbrook Educational Foundation or call the elementary school. The winery does not curate the vendors. Thanks for your understanding. Yes, we’re open for Easter. Second annual rosé wine festival right here in Humboldt County. This fabulous, super fun event features 12 mostly local pink wines, as well as a release of Fieldbrook’s new 2018 Rosato de sangiovese (2017 winner of SF Chronicle gold medal), as well as our 2018 rosé of pinot noir, made with organically grown grapes up on the Trinity River in Humboldt County. Admission price allows you to taste the wines, and sample appetizers with Cypress Grove cheeses, Josh Fox breads and more. Cypress Grove is a cosponsor of this event. Buy tickets online (click wine + tix above). Details: Entry gets you in the door and 8 tokens. Each token gets you a 1.5 ounce pour of a particular wine. You can trade 4 tokens in for a full pour. Additional tokens are 3/$5. Advance ticket purchasers get an additional token (9 total), so buy one now. “Day of” and at the door price is still $25, but you only get 8 tokens. Our stemless glasses are not included in this year’s ticket price, however you can buy one to take home for $5. Appetizers are included. Cypress Grove is a cosponsor of the event, and there will be all sorts of cheeses, as well as bread from local bakeries including Josh Fox breads. 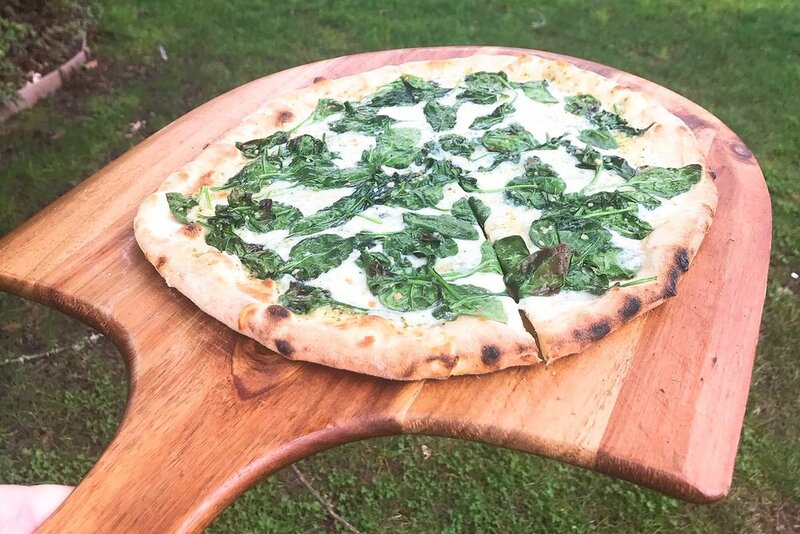 Pizzas from our new wood-fired pizza oven will be for sale that day of the event as well. .
Children over 5 and non-drinkers cost $5 each, and no advance purchase is required for these folks. Food and beverages may include lemonade, iced tea, bread, cheese, fruit, vegetables, fish, additional appetizers. If it rains, the event will be held in our main winery building and a series of tents. We’ll have heaters, but bring jackets anyway because the winery is kept chilly. Children 4 and under may attend free of charge. Each ticket is $25, out of which $10 is a direct donation to Planned Parenthood. The McKinleyville Chamber of Commerce and the McKinleyville Lions Club invite you to participate in their fall beer and wine walk along Central Avenue in McKinleyville. Last year’s walk was a huge success. It will be held on Saturday, September 15 from 4:00 to 8:00 p.m.
We will be paired with Ramone's Bakery and Cafe. Come see us in Mckinleyville! $18 at door on the day of event. $23 at door on day of event. Nondrinkers and children over five are a $5 fee per person, paid at entry during the event.